Born in the Navy SEALs, Suspension Training bodyweight exercise develops strength, balance, flexibility and core stability simultaneously. It requires the use of the TRX Suspension Trainer, a highly portable performance training tool that leverages gravity and the user’s body weight to complete hundreds of exercises. Using the TRX in a circuit style format will compliment your Pilates practice by working muscle groups from different angles and give you the chance to be in charge of your intensity. This class is considered an intermediate to advanced class. 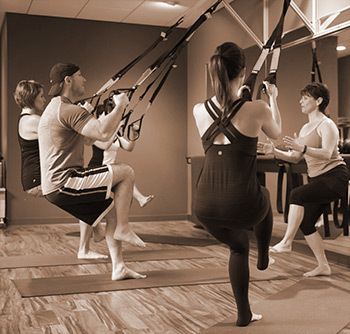 If you are new to exercise and pilates we recommend doing several pilates mat classes first. The TRX® Suspension Trainer is infinitely scalable, so no matter where you are on the fitness continuum, you can get a fast, fun and effective total-body workout. I am hooked. I have started Barre classes and absolutely love the challenge it brings to me every time. Rebecca’s knowledge and attention to techniques makes every move effective. With the instructors on staff, I can attend a class and always feel I am getting the benefits that I would get if I signed up for a private session. I’m pumped to add the boot camp class this week! Thanks to Mindful Movements I am getting through this dreadful winter! I have taken classes at Mindful Movements for about 5 years. Rebecca is truly a professional and ambitious business owner in addition to being an exceptional fitness instructor. She has several talented trainers on staff, like Mac. The instructors teach with just the right amount of fun and seriousness. I highly endorse their classes. Love, love, love Mindful Movements Pilates Studio! Great atmosphere, Great teachers and SUPER classes! I had not participated in a Barre class for a while and did so last Saturday, what an AMAZING workout. Love Barre class! Always challenging and no one is ever judgmental. Looking forward to trying new classes soon. Rebecca and her staff are motivated by the latest knowledge of how the body works, not by the latest exercise fads. Simply, they are the best!